A somber mood gripped the Kenneth Kaunda International Airport this afternoon as the plane carrying former first Lady Mama Betty Kaunda's remains touched down. Mama Betty Kaunda aged 83 died in Harare, Zimbabwe yesterday were she had gone to visit her daughter Musata Kaunda Banda. The Plane carrying her remains touched down at the KK international airport named after her husband of 66 years at exactly 14:00 hours. 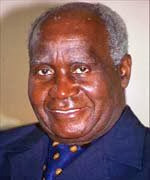 Accompanying his wife's body was Zambia's first republican president Dr Kenneth Kaunda and other family members.